Lovely Blooms for late summer garden colour and perfect for cut flower displays. These will be in colour when other flowers are fading, with red, cream, gold & purple blooms. Perfect for growing at the back of a border or planted in pots with canes for support. Supplied as 12 jumbo plug plants - 3 each of 4 colours. Garden Bloom Chrysanthemums bear a single large flower rather than the multiple flowers that Spray types produce. These are really fashionable with top florists and command very high prices per stem, so if you grow your own you can have a magnificent display indoors and out and also save a small fortune! Throughout the growing season, remove the side shoots on a fortnightly basis (these are the little growths between the leaves and the stem) as this directs all of the energy in to the single large top flower. 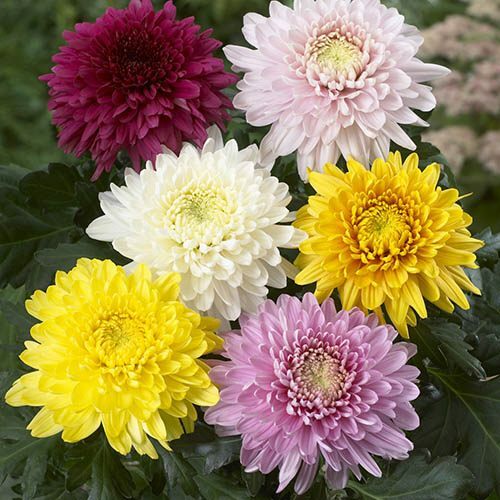 They bloom from September to October, so they make a perfect companion to the spray chrysanthemums, with each plant giving you approximately 3-4 stems of cut-able flowers. They are ready to cut as soon as you see the first sign of colour appearing and when they get to this stage, cut the stems quite low down, around 15cm (6') from the ground level, and remove the lower leaves from the cut stems prior to plunging them in to a tall vase of cold water. As an indoor display, they will last at least 2 weeks, but do change the water every few days as this keeps them in the best possible condition. Support them throughout the growing season with a strong bamboo cane per plant. Although a little more work is involved in growing Bloom Chrysanthemums, the quality and impact of the flowers will more than repay you for your effort! Supplied as 12 jumbo plugs (2.5 - 3.5cm diameter), 3 each of 4 varieties listed. Will flower from August until late into the autumn. Will grow to 90cm (3ft). Moderately frost hardy, but to over winter, lift the plants and store in a cool but frost free shed or greenhouse.